This is probably my favourite of all the dresses I made this summer, I just love how it turned out. This was the happy result of a vintage dress inspiration and the right fabric coming along at the right time. 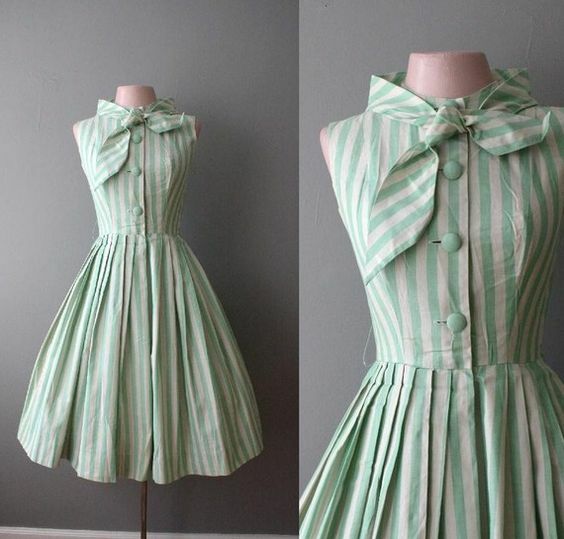 Next up in my Summer Frock Parade is this little number in a cute pistachio and ivory print cotton (probably a quilting cotton). It also continues with the mint/aqua and coral theme I’ve got going on this year – yes, I know, I haven’t posted anything coral yet, I’ll get there! 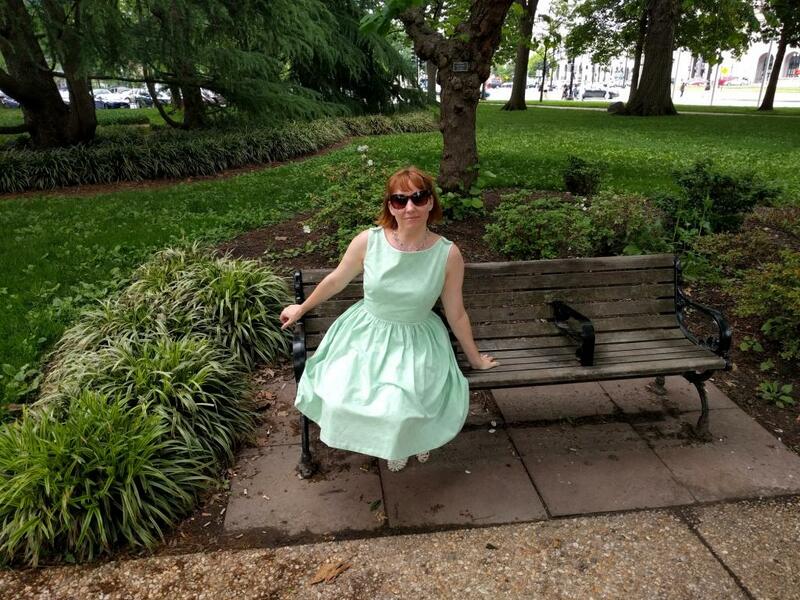 2016 Summer Frock Parade – Minty Fresh! Simplicity 3925 – O, Canada! Happy Canada Day everyone! Or, for those of us who like to “kick it old school”: Happy Dominion Day! Yes, it’s that time of year again! Or it was, a couple of weeks ago. This year’s ensemble was nothing like last year’s mammoth undertaking. With a tentative PhD thesis defense date set, there was no way I could devote that much time this year. To make things easier for myself I used sewing patterns I already had, and just did a bit of frankenpatterning. 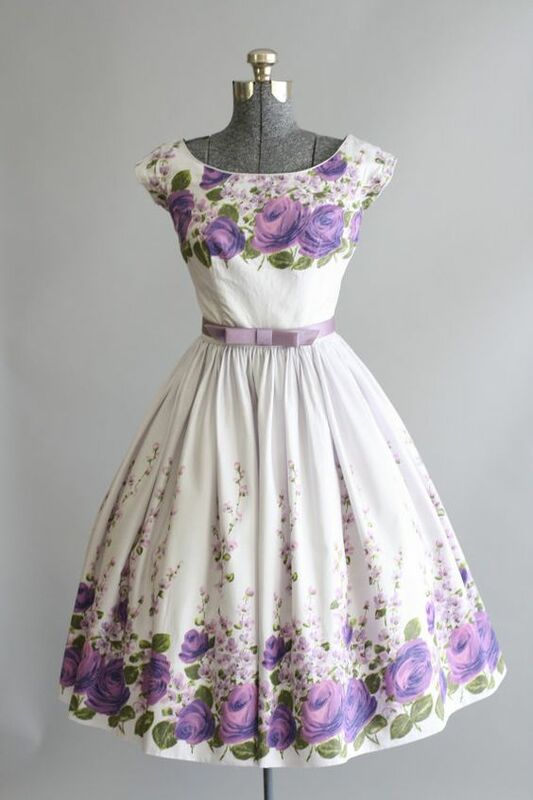 I combined two 1950s patterns for the dress and used one other for the bolero. Jimminy Crispies! 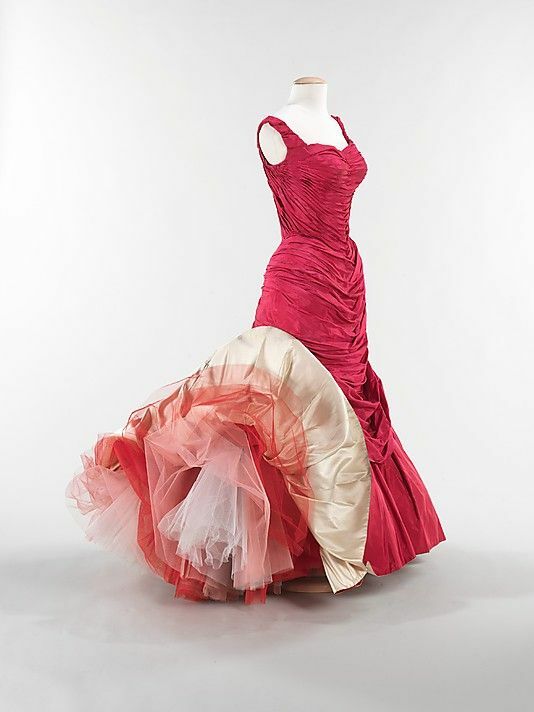 There’s a Charles James Gown in my living room!! It’s finished! It’s finished! Okay – so, technically it was finished almost 3 weeks ago. 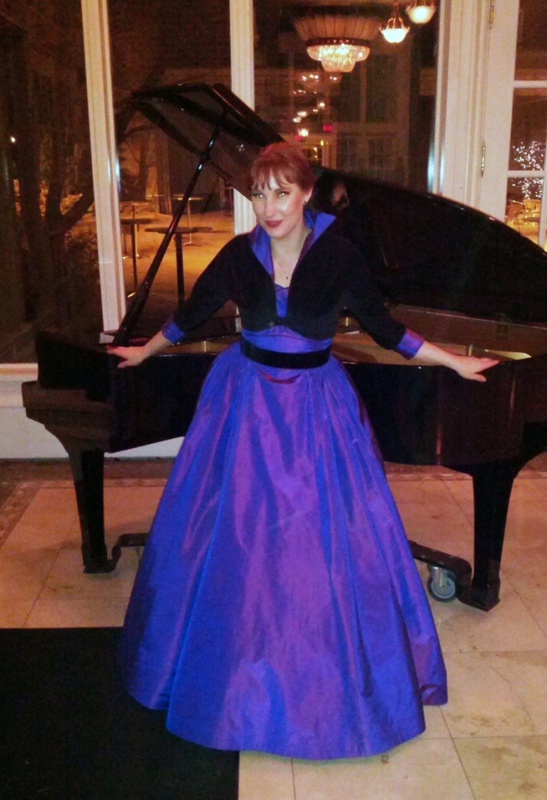 Since I had another Garrison Ball gown to finish afterwards (for a friend), I’m pretty behind on blogging about this. Oh well. Before I get to the final reveal I’m going to take you through the bodice finishing, I’m really happy with how cleanly it turned out. Oh, and if this is your first time seeing this project, you can go here for a list of the in-progress posts – if you’re interested. 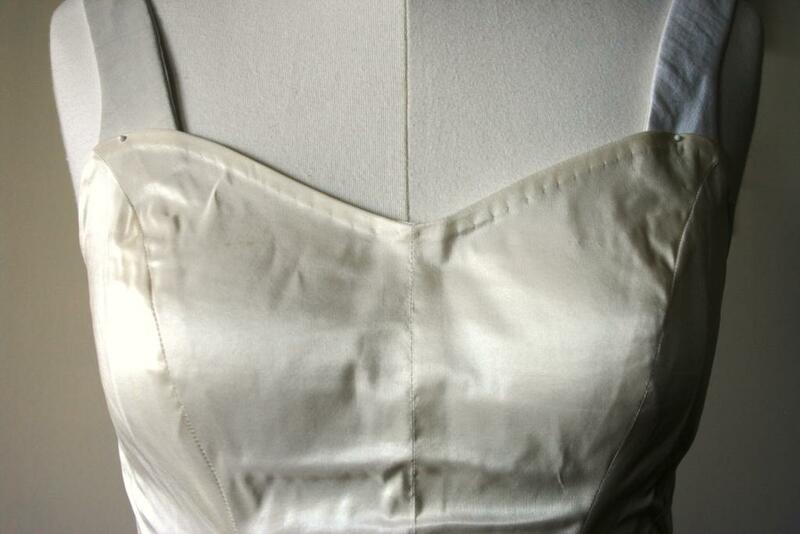 Tree Progress: Bodice and Upper Skirt Covering – aka: Very Scary Part! Draping is not something I have a lot of experience with. So choosing a style to reproduce where one of the main features is a lot of draped tucks to create a very sculptural look was not a decision that was good for my stress levels. This part was far more intimidating than any of the hard-core foundation work that came before. I think a lot of my trepidation came from when I was working on my wedding dress. I spent at least 3 months trying to make a one-shoulder draped and ruched bodice work and just couldn’t. 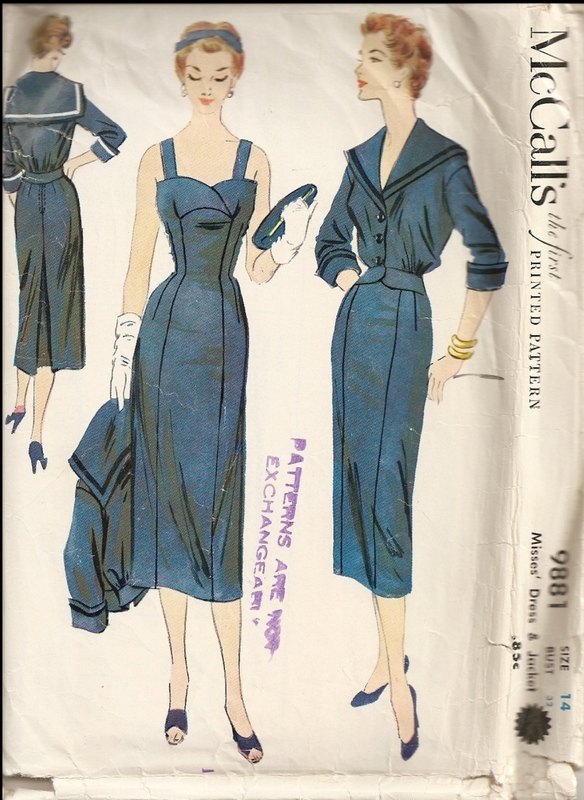 Ultimately I scrapped it and went for a much simpler design – ironically, it was taken from another Charles James gown! Aha…ha….ha. I was scared to start this, so I put it off as long as possible. As part of procrastinating against the inevitable I decided to do a really nice finish to the upper edge of the bodice that would never been seen once it was finished. Unfortunately, I only remembered to take pictures after the dress was back on Maddy and ready for muslining the bodice covering. Putting the dress on Maddy and taking it off her again had got to the point of being pretty labour-intensive, so exterior photo of this only. Sorry! 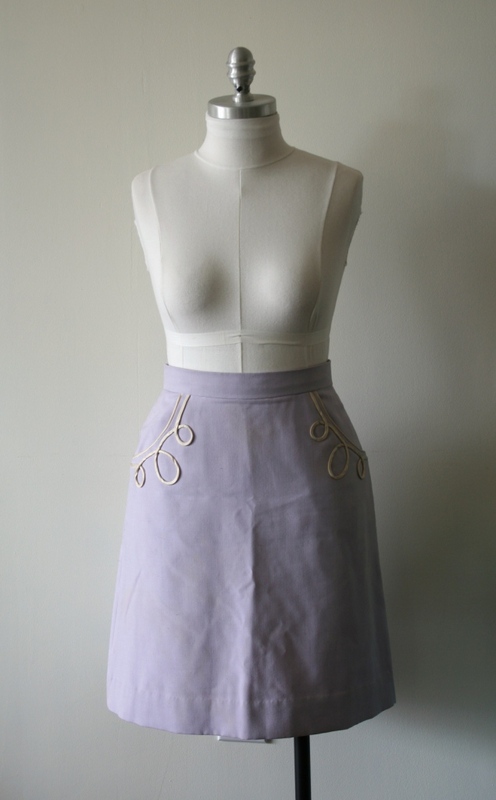 There was only a 1/4″ seam allowance for the bodic upper edge; what I decided to do was sew a length of narrow double fold bias tape around it, turn it to the inside and hand-stitch it to the bodice foundation interior. This did have the practical advantage of adding more substance to that edge so it would hold-up better when it came time to fold all the pleated fabric of the bodice covering over it. At least it seems logical to me that it would. NB: the shoulder straps are not sewn to the bodice front here, just pinned. And no, you’re not seeing that wrong, they are not showing identical fabrics…..
You guys, I think this was probably the most fun part of the whole project! Huge, multi-layered tulle and silk flounces? YES PLEASE. I did not have any pattern pieces or measurements for the flounces so I had to wing it. All I knew was that there was supposed to be a lot of fabric in these, so with “a lot” I went! My math went something like this: guestimating that the circumference of the petticoat flare was in and around 2m (just over 2 yards) I figured 4x fullness should be pretty good. So, each flounce layer is 8m (about 9 yds) in circumference. Whee! After the “buttresses” the petticoat flare was the most revelatory aspect for me of Tree’s foundation. 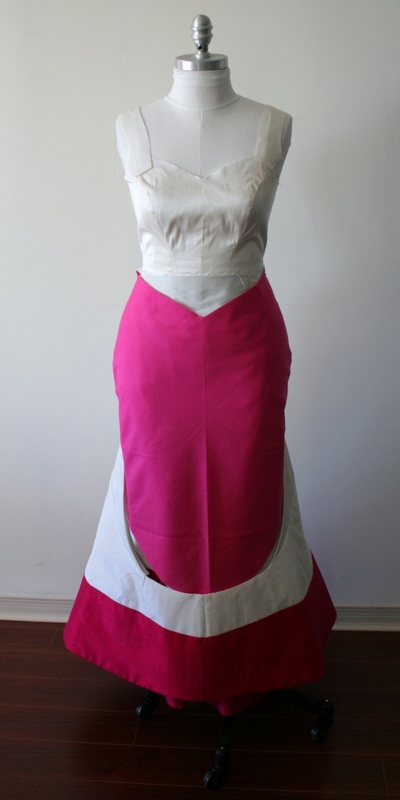 With support from the buttresses this piece really creates the base shape for the dress skirt and I found it a really interesting piece of dressmaking. I didn’t take as many construction photos of this layer as I perhaps should have, but for such an odd-looking piece I think it’s actually pretty straight-forward once you see it made up and on the form.